Battroborg toys are battling robots from Japan played with a nunchuk-style controller. Battroborg is new to the UK but well known in Japan where it made its debut, selling over ten thousand borgs in the first two days. The Tomy Company Ltd, or Takara Tomy as it’s known in Japan, was founded in 1924 by Japanese toymaker Eiichiro Tomiyama. Tomy has made electronic toys for decades and produced its first robot toy in the 60’s. Battroborg is a sophisticated modern marriage of gaming and offline play in which no screen is required. Simply throw punches with the wire-free motion-detecting nunchuks and let the Battroborgs hammer blows on each other till one borg’s light indicates a win by knockout. A direct hit scores a flash and five hits equals a win by TKO. What’s more the nunchuk controllers actually vibrate and produce sound effects in real time when punches are landed. 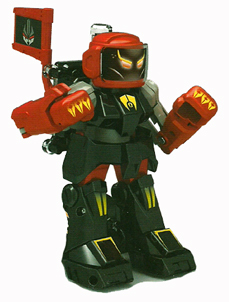 Battroborgs stand around 3.5″ tall and are available in a range of colours. 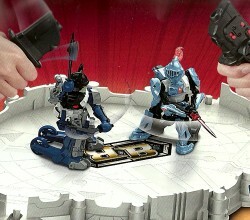 The robots are available separately or in a set with the Battroborg Ring, or Hexaring, which includes two Battroborg toys. New in 2014 is Battroborg Warrior which introduces two new Battle Arena sets – Knight Vs Viking and Samurai Vs Ninja. Battroborg Warriors feature customisable weapons and armour and a revised ‘Katana’ controller. This entry was posted in Battroborg and tagged Battroborg Toys. Bookmark the permalink.